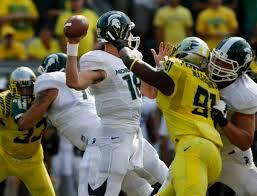 Michigan State quarterback gets a hard rush from Oregon linebacker Tony Washington. Spartan loss to Oregon has apparently eliminated the Big 10 from playoff consideration. PHILADELPHIA—The aftermath of last Saturday’s college football games has me shaking my head and coming to the conclusion that the new four-team college football playoff format is seriously flawed even before it begins. The premier programs of the Big-10 Conference, seventh-ranked Michigan State lost to No. 3 Oregon, eighth-ranked Ohio State lost to unranked Virginia Tech and Michigan got shutout 31-0 by Notre Dame. Those high-profile non-conference losses not only cast doubt on the conference’s credibility, but according to several college football media people, it has eliminated the Big-10’s chances of having a team in the new college playoff this season. Ohio State lost at home to unranked Virginia Tech. Along with losses by Michigan and Michigan State, the Big Ten’s credibility as a power conference has been called into question by college football experts. Really? Two weeks into the season and we’ve eliminated an entire conference from playoff contention. If you’re thinking there’s something wrong that, you’re absolutely right because there is something wrong. Now before you go off thinking that I’m feeling sorry for the Big-10, this is not that column because they signed up for this madness. What’s really under indictment here is the idea that the five power conferences, including the Big-10, came up with a format for themselves that had already eliminated the other five conferences—the Sunbelt, Mid-America, Conference USA, the Mountain West and the American Athletic Conference from competing for a national championship. And now the beast that is the super conferences are feeding off themselves with a bit of elitism within their own insular group. At some point, they are going to be cries to expand the playoffs-even it is among the super conferences. They probably won’t think of doing it until Southeastern Conference schools finds themselves where the Big-10 is now. In the cycle of sports all conferences go through their share of down years. As it stands now, the College Football Playoff will be here for the next 12 years thanks to a $5.64 billion TV deal the super conferences made with ESPN. A 13-person committee selects the teams for the two semifinal games while teams representing the “big five” will fill the other four bowl games with one guaranteed spot going to the highest-ranked representative from the mid-major group of five conferences. The bone they throw to the Mountain Wests’ and Conference USA’s of the world is nothing more than a pat on the head. For me, comparing college football’s playoff to the NCAA basketball tournament is like former Democratic Vice-Presidential nominee Sen. Lloyd Bentsen telling former Vice-President Dan Quayle that he’s no John F. Kennedy. Unlike the equality the NCAA basketball tournament where smaller schools are allowed to compete, the current College Football Playoff allows no room for the Cinderella story as we have seen in basketball. So when a team out of a Conference USA or Mountain West and they’re undefeated or have a solid record, they won’t get the opportunity to test themselves in the spotlight. Under this system, the smaller FBS conferences are marginalized to play in meaningless Bowl games without the opportunity to compete for a national championship. That to me is shameful because the power conferences want to hoard the money and resources for themselves. And so this brings back to the Big-10’s so-called “elimination” from College Football Playoff in just the second week is a good reason for expanding the field. It’s ridiculous to say that a team representing any conference is out of playoff contention in early September. Again, I have no sympathy for the Big 10 or any of the five super conferences who may not have a team in January’s playoff because you created a playoff system that freezes out the other five smaller conferences from having any chance to compete. It is a screwed up by-product of your own insular elitism and greed. I’ve always said that there needs to be a 16-team playoff system where the conference champs of all 10 FBS conferences get automatic bids while the six at-large bids go to the highest ranked non-conference champions. That’s more fair because one loss in week two on the way to winning a conference title should not knock you out of the playoffs before October. Unfortunately, the idea of equality of any kind in big-time college sports is a foreign concept, whether it’s giving a mid-major program like Boise State a legitimate chance to compete for a national championship in football or even sharing a percentage of the revenue with the student athletes. Stephen Satell’s book, “Trying to Make This Thing Right” explores of the world of college athletics and academics. Photo by Chris Murray. PHILADELPHIA –If there were a non-athlete or coach who could give you some insight on the good, the bad and the exploitive nature of college athletics, Stephen Satell could. He’s seen it up close. From 1989 to 1992, Satell was a tutor for the University of Massachusetts basketball team when John Calipari was the team’s head coach. During that time, UMass was an up and coming college basketball program whose rise to national prominence came with a stint on NCAA probation. Satell’s book, “Trying to Make Things Right,” is a fictionalized account of his time at UMass, the relationships he had with the players he tutored, and his relationship with Calipari, who is now the popular, yet controversial head coach at the University of Kentucky. The story itself is a compelling coming of age tale focused on four central characters– Ka-Shawn, Tutor, Magic and Coach– and the parts they played in the rise of a college basketball program. It’s a story of how the road to hell is paved with good intentions and how that road can get even rockier when ambition trumps all. The point of the book is to show that everyone benefits when the “scholar” part of the phrase “scholar athlete” is emphasized, said Satell, a doctoral candidate in Temple University’s African American Studies program. If the same things that make a successful athlete, things like teamwork, intensity, concentration and a knowledge of the fundamentals, are applied to academics, success is a given, he said. Satell, who is white, grew up in Philadelphia and lived among African-Americans in some of the city’s toughest neighborhoods and in Ch. He said he enjoyed his time working with Black athletes and helping them navigate academia despite coming from impoverished school districts. How the athletes in the story overcame their academic challenges to become successful on the court and in the classroom is what Satell hopes people take from his book. During his time at UMass, Satell successfully tutored student-athletes who were admitted to the university under the NCAA’s Proposition 48 because they didn’t have the minimum SAT scores or grades to play right away. Those students have to sit out their freshman year of school. The program maintained an academics-first focus until the Minutemen made their first NCAA Tournament Sweet 16 appearance in 1992, Satell said. Although the team lost to the Kentucky Wildcats, it was a taste of success. After that, Calipari’s priorities changed. The “scholar” had been removed from the phrase “scholar athlete” in favor of an almost maniacal focus on basketball, Satell said. “Once Calipari had made his reputation on the basketball court, he no longer needed to recruit to the academics,” Satell said. Oddly enough, Calipari’s teams UMass and Memphis had to vacate their appearances in the Final Four because of NCAA violations. At Memphis, the school was placed on probation because another student took the SAT in place of star guard Derrick Rose, now a guard with the Chicago Bulls. At a time when the integrity of college athletics is under constant scrutiny by fans, school administrators and the media, “Trying to Make Things Right,” is a unique work of historical fiction that explores the good, bad and the ugly of college athletics.